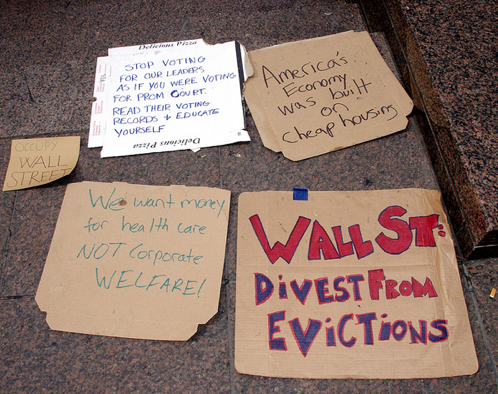 COMMENTARY Occupy Wall Street is going house-hunting. A spinoff of the protest movement, Occupy Our Homes, is launching a campaign Tuesday to help people facing foreclosure fight eviction. "This is not just about one event; this is a huge frontier for us. We can do these kinds of actions all the time, and we should. And it doesn't have to be just us. We got to do this one right so we can inspire people to do it theirselves." A number of organizations linking local residents, housing advocates and others are springing up to resist foreclosures. No One Leaves! of Springfield, Mass., uses tactics ranging from property blockades to resisting foreclosures in court. In New York, Organizing for Occupation is also encouraging "non-violent direct action" to stop foreclosures. "Occupiers" in California, Georgia, Ohio and elsewhere have had some success temporarily blocking foreclosures or re-taking seized homes. On occasion, they've even gotten help from local law enforcement authorities, such as the sheriff's deputies and movers who last month refused to kick a 103-year-old Atlanta woman and her daughter out of their home. Foreclosures are a natural target for Occupy-affiliated activists, who themselves were evicted last month from the movement's spiritual home in New York's Zuccotti Park and more recently from several college campuses and other "encampments" around the country. Millions of people remain "underwater" on their mortgages, with advocacy group the Center for Responsible Lending saying that the U.S. is not even halfway through the foreclosure crisis. A Bank of America (BAC) analyst predicts a total of 14 million foreclosures before the crisis recedes. That's a quarter of all U.S. households with a mortgage. The damage also will affect more financially secure homeowners, as the swelling inventory of foreclosed homes pushes down residential real estate prices. In other words, foreclosure causes a world of hurt -- for homeowners, neighbors and the economy at large. Could that raise the pressure on policymakers to take stronger action? Perhaps, especially heading into electoral season. Certainly, the Obama administration's efforts to stem the tide of foreclosures have largely been a bust. The U.S. Treasury Department has turned a blind eye to banks and loan servicers that have violated the rules of its main loan-modification program. President Obama made a campaign promise that he would support amending the bankruptcy code to do exactly what the protesters are calling for: reduce mortgage principal to the value of the house. He immediately backed off that promise when he got to office. The idea of realigning mortgages with home prices has met with stiff, stiff resistance from the banking industry. So far -- amazingly, given the financial crisis -- people in Washington and the administration and Congress have continued listening to the complaints of the industry. The fact is, we're going to do this sooner or later. We can reduce mortgage balances to the value of homes either through the painful process of foreclosing houses, at 100,000 per month for the next 10 years. Or we could have a more systematic program and write the mortgages down for the people who are in the houses now. The Occupy campaign's focus on wrongful evictions could help the group -- and the country -- in another way. Friends and foes of the movement have called on protesters to clarify the group's agenda and demands. In wake of the greatest housing crash in U.S. history, fighting foreclosure is about as clear as it gets. Meanwhile, pinning down policymakers on where they stand on issues such as cram-down legislation could push the debate in the right direction.